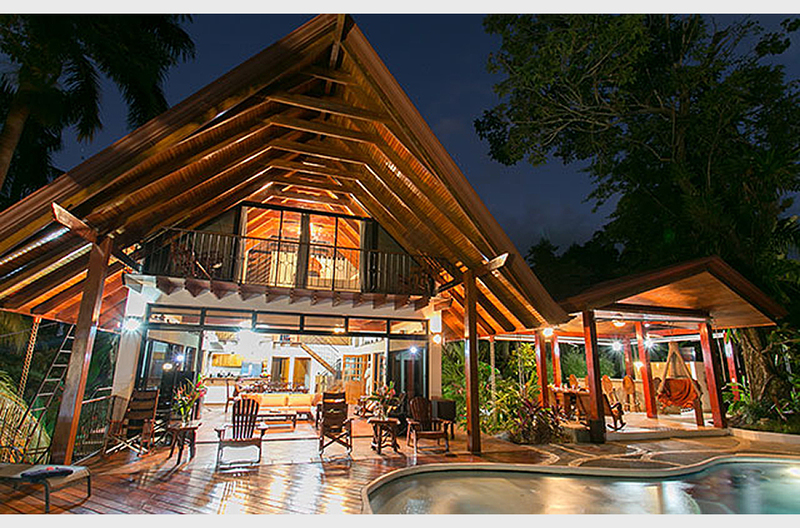 Manuel Antonio's most unique and popular luxury estate home, redefines the art of tropical living. Fully air-conditioned with six bedrooms, six baths, waterfall pool, guesthouse and a separate new casita, the villa is located on Manuel Antonio's most private hilltop estate. The stunning ocean views and spectacular nightly sunsets overlooking the Pacific Ocean are sure to take your breath away. Enjoy the sun on the expansive deck, or sit in the shade in the new 800 square foot rancho which includes a bar, lounge and outdoor cooking area with seating for 19 to dine. Swim and play under the waterfalls of the infinity pool which includes bar-stools in the water. Located at the end of the road on a hilltop over the Pacific Ocean, and in a particularly private part of Manuel Antonio, this villa offers complete privacy, while being ideally located halfway between the adjoining towns of Quepos and Manuel Antonio. The Manuel Antonio National Park and the multiple beaches rimmed with pristine rainforest, are the treasured jewel of Costa Rica's park system and are less than 10 minutes away while the town of Quepos, with it's wide variety of shopping, bars, casino, markets, and sport-fishing fleet is less than five minutes in the other direction. This villa is surrounded by lush gardens and a tropical rainforest which borders an important and well-traveled biological corridor through the area. Guests can expect to see an abundance of wildlife on a frequent basis. Three types of friendly monkeys visit the property regularly, as well as the fascinating and slow moving tree sloths (up to five at a time have been spotted), a large variety of birds, and a plethora of other sometimes hard to describe animals. Bring your camera and you'll be sure to enjoy the best of the jungle and it's amazing inhabitants from the terraces and gardens of this spectacular villa. The home itself is constructed almost entirely out of almond wood. Fine craftsmanship and loving attention to details are evident throughout the house. The large infinity swimming pool with its expansive decks, was designed by an award winning architect for outdoor relaxing and entertaining, while the beautiful new rancho with a bar, barbeque and dining area and outdoor plasma TV is perfect for hosting groups or parties. This villa has been specially designed for the varying weather of the tropics, and is suitable and comfortable for enjoying every day, season, or mood. The 30-foot high hardwood ceilings provide excellent ventilation, and sliding glass doors all the way around allow you to either open the home completely to the fresh Pacific breezes by day and the sounds of the jungle at night, or to close it up and enjoy the experience in fully air conditioned comfort. You will enjoy every unique room of this home, each with a private bathroom, four with private terraces, and three with their own kitchenettes. Every area is truly unique, such as the 20-foot almond-wood catwalk suspended through the center of the home, which leads to the master suite with expansive windows facing the Pacific. The full time staff includes maid service seven days a week and a full time exclusive concierge to assist you with coordinating your transportation from the airport, arrange tours, schedule massages and all other requirements. Amenities include phone, computer with high speed internet and wireless connection, Direct TV, dual temperature wine refrigerator, iPod speaker system, iPod capable alarm clocks, fine linens and towels, full kitchenware and much more. Also included is a special guide to all of the area's best tours as well as information and directions to the finest (and most interesting) places and beaches. Bedrooms #3 and #4 are located on the ground level of the villa. The second floor of the villa consists of the living room, kitchen, pool, large outdoor dining area and bedroom #2. The master bedroom #1 is located on the third floor. Bedrooms #5 and #6 are located in separate casitas. Your personal concierge will be happy to help you with even the smallest of special requests to make your vacation special, or with the planning of weddings and events. With many years of experience, the concierge can arrange practically anything you need. It is our sincere pleasure to make your vacation as easy, fun, and enjoyable for you as possible, so please give us a call or e-mail, and then get ready to enjoy the best of Costa Rica. THIS VILLA CAN BE RENTED TOGETHER WITH ITS NEIGHBORING VILLA, KOSHER CASAS VILLA #MA405 TO ACCOMMODATE UP TO 32 PEOPLE TRAVELING TOGETHER. Neighborhood Located at the end of the road on a hilltop overlooking the Pacific Ocean. There is a loft area with a bed for additional guests outside this bedroom. We had a fabulous time. Everything you organized was perfect. Dear Eve, Apologies that it's taken me so long to email you. Thank you so much for the care attention to detail for our family holiday. The villa is great and we all particularly love our chef Ronald. But everyone has been amazing so far.Sabrina has welcomed us like her family. Bending backwards to please us and get everything we need. She does this all this with a smile on her face. Many thanks. Shabbat shalom, and thank u for making this wonderful kosher Costa Rican adventure. Family of 6 from London, England. Thank you! So happy your family had a great vacation. I look forward to working with you again.